The EcoCar Team at the University of Alberta is a student-run engineering organization that designs and builds hydrogen fuel cell powered vehicles. 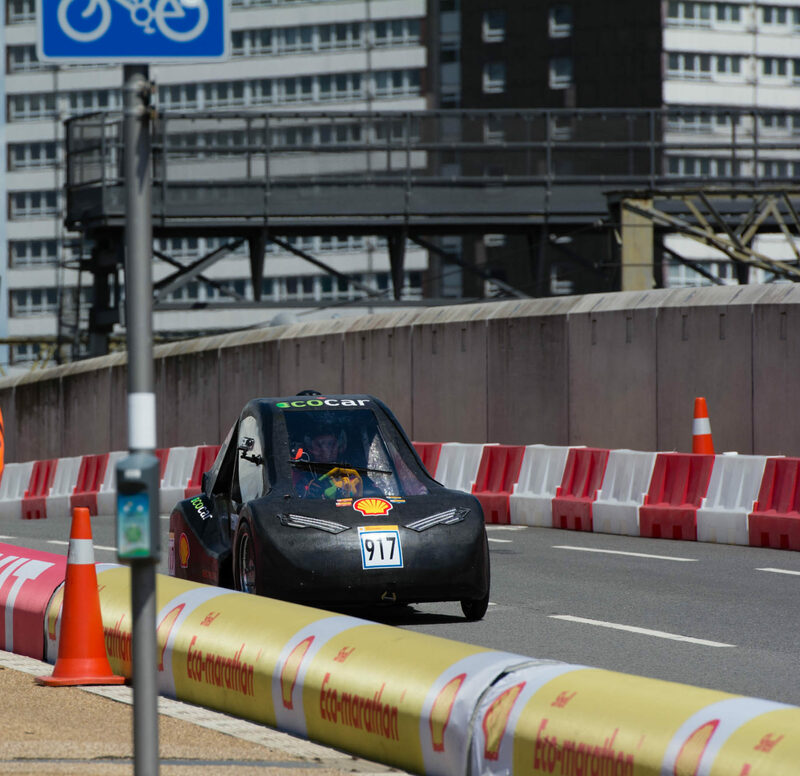 The team primarily races at the annual Shell Eco-Marathon Americas. However, in recent times, the team has competed in the Shell Eco-marathon Europe and might attend Eco-marathons in Brazil in the future. Since the team’s formation in 2010, we have completed our first generation vehicle, Steve, placed second in the Shell Eco-Marathon in 2012 (our first year competing) and placed first in 2014. Our latest vehicle, Alice, which took two years to build, allowed us to clinch first place at the Shell Eco-marathon 2016 and allowed us to attend the Shell Eco-marathon Europe and Drivers’ World Championship. The team was created to develop and explore innovative solutions in the transportation sector. Our goal is to design and build zero emission vehicles to compete in international competitions and raise awareness about different sustainable automotive technologies. Through participation in competitions and promotional tours, the team hopes to help educate the local community and provide a showpiece for sustainable and innovative solutions. We have now begun the design of a new car for the prototype category. This presents a new set of challenges for the team and we are all looking forward to building the vehicle. The EcoCar team is comprised of three subdivisions: the Electrical Engineering Division, Mechanical Engineering Division, and the Business Division. The Electrical Engineering team focuses on the electrical and control systems of the car. This includes the fuel cell, motors, controllers, power electronics, driver controls, sensors and the LCD display. Members work on improving efficiency, monitoring the vehicle, and developing electrical components. The Mechanical Engineering team focuses on the mechanical systems and structural design of the car. This includes working on the chassis, steering, braking, suspension, and driver interface. Members work on the aesthetics and ergonomics of the vehicle, reducing weight, optimizing weight to power, and ensuring the car’s performance in the race. The Business Division markets and promotes the team, attracts funds and sponsors, manages finances, organizes events, and does all the work in between that allows the team to run smoothly.